Wild Horses couldn’t keep me away from this story! A new series of blog posts on Wild Mustangs and their new lives. Today a first in the series is an introduction. 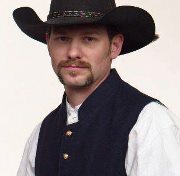 My friend Geoff Goodson, horse trainer, farrier, cowboy mounted shooter has embarked on a new adventure. I plan to take us all along vicariously through the blog. June 22, 2012 Geoff will pick up a Mustang in Tennessee and begin a 100 Day Mustang Extreme Makeover as seen on RFD TV. Finding a home and career for a Mustang not so long ago part of the wind of the western range is the goal. Expansions of the herds of wild horses limits food and health. 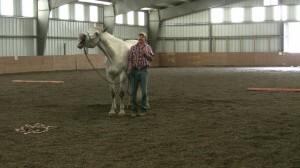 Each year some go into training programs to become equine companions. Follow along as Geoff and his family embark on a training regimen that will ultimately place him in competition with other trainers and Mustangs in Clemson, South Carolina in October. It all begins with the first touch. Here Geoff begins work with another Mustang. Lil Joe Wrangler. 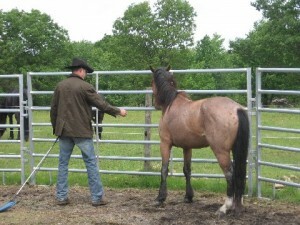 Lil Joe arrived earlier this month a former member of the Pryor Mountain Herd of Mustangs. His journey to a new career is beginning, since they discovered Lil Joe has an internal congenital issue the Goodson family hope surgery can correct and then he will become an adopted member of their equine family. Lil Joe will become a Mustang ambassador in CT. Even the horses in Geoff’s clinics are talking about his training techniques! Follow or subscribe the blog if you would like to keep up with the 100 Day Mustang Extreme Makeover story! This is a wild west story come east!